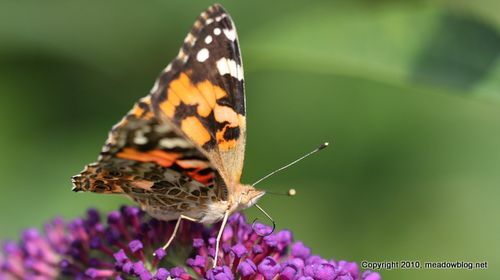 summer as schedules allow, using a new digital DeKorte Butterfly Count Sheet that the public is free to download and use. After our noon Marsh Discovery Trail Walk today, we counted 11 species of butterflies — including an American Lady (above) and Viceroy (right) — plus a Snowberry Clear-winged Moth. 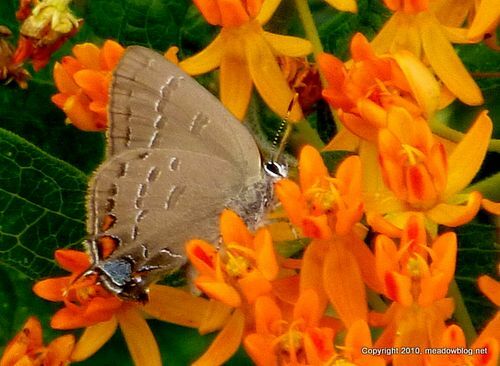 Full list and Snowberry Clearwing photo follow. We took this shot last Thursday at Harrier Meadow. 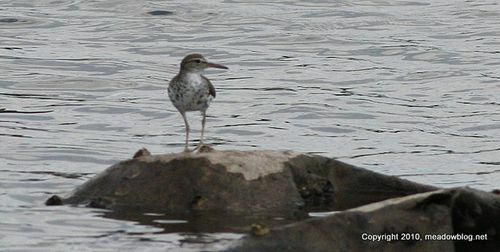 We are thinking Spotted Sandpiper. Any dissenters? 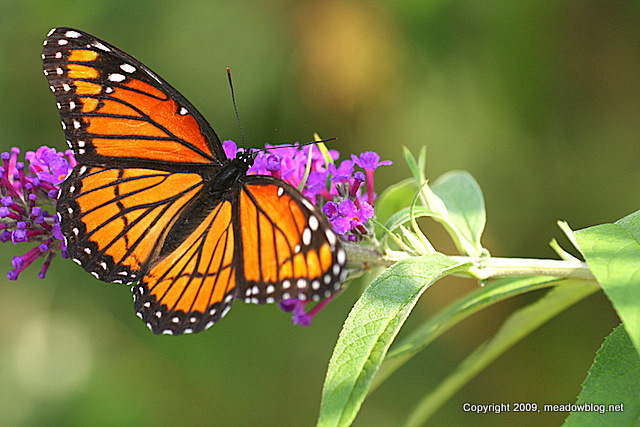 In the interests of citizen science, we are working up a digital tally sheet that you can copy-and-paste and use to submit butterfly sightings at DeKorte Park. 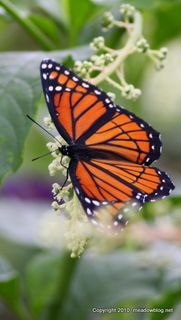 We understand that butterfly sightings in our part of the state are under-reported, and we wanted to at least see if we could get the ball rolling here. We just did a quick count, and our timing was great. We counted at least eight species, including two dozen skippers of various types, with Broad-winged Skippers like the one above predominating. Please e-mail Jim Wright here with your butterfly counts and — equally important — suggestions on improving this work in progress. Results of our recent count are below. From what we hear, water levels at DeKorte Park's Shorebird Pool will likely return to normal later this week, possibly as early as tomorrow (Tuesday). We have an hour-long walk along the Marsh Discovery Trail Tuesdays and Thursdays at noon. 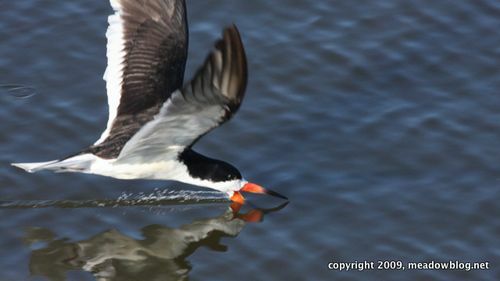 Last Fourth of July weekend, the New Jersey Meadowlands Commission and the Bergen County Audubon Society had their first-ever first-Sunday-of-the-Month walk, and saw some great birds, including the Black Skimmer above. We are beginning Year Two of our partnership with another DeKorte walk this Sunday at 10 a.m. Details follow. NY1 did a nice short segment on our Tuesday and Thursday noon walks on the otherwise-closed Marsh Discovery Trail. Link to NY1 segment is here. By popular demand, we are providing a downloadable PDf of our Hackensack River Guide. This way you can see a digital version and save paper. Do not try to print it out… It is set up to be read on a computer. Scroll down for digital versions of the other five guides, posted on this blog last week. By popular demand, we are providing a downloadable PDf of our Mill Creek Marsh Paddling Guide. We are posting all six of our new or reprinted guides, with a different one each day. Next: The Hackensack River Guide.